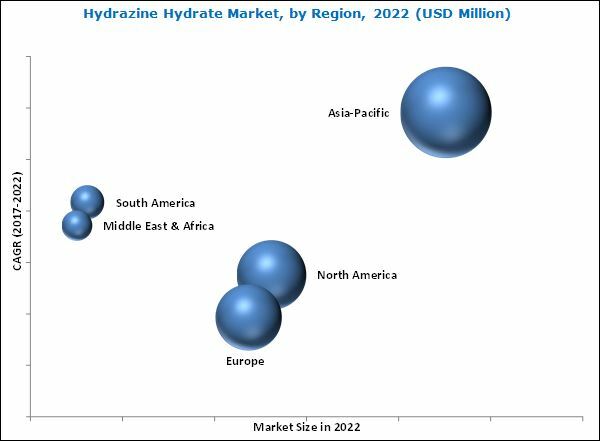 [159 Pages Report] Hydrazine Hydrate Market size was valued at USD 395.7 Million in 2016 and is projected to reach USD 531.1 Million by 2022, at a CAGR of 5.5% between 2017 and 2022. The base year considered for the study is 2016, while the forecast period is between 2017 and 2022. Both, top-down and bottom-up approaches have been used to estimate and validate the size of the global hydrazine hydrate market, and to determine the sizes of various other dependent submarkets. The research study involved extensive use of secondary sources, directories, and databases, such as Hoovers, Bloomberg, Chemical Weekly, Factiva, and other government and private websites to identify and collect information useful for a technical, market-oriented, and commercial study of the global hydrazine hydrate market. The value chain of the global hydrazine hydrate market includes sourcing of basic raw materials, manufacturing and supplying raw materials to hydrazine hydrate manufacturers, and usage of hydrazine hydrate in various applications. The raw materials for hydrazine hydrate are nitrogen and hydrogen gases. The major raw material suppliers include Praxair, Air Products, The Linde Group, Elgas Limited, and Air Liquide. The raw materials are used by various hydrazine hydrate manufacturers, which include Arkema, LANXESS, Lonza, Otsuka-MGC Chemical Company, Yaxing Chemical, Yibin Tianyuan Group, HPLA Group, and Hunan Zhuzhou Chemical Group. This research report categorizes the global hydrazine hydrate market on the basis of concentration level, application, and region. The global hydrazine hydrate market is projected to reach USD 531.1 Million by 2022, at a CAGR of 5.5% from 2017 to 2022. Hydrazine hydrate is a highly reactive, powerful, colorless, and highly explosive unstable inorganic chemical compound. Owing to its high reactivity, hydrazine hydrate is used in various industrial applications. Hydrazine hydrate is used in polymerization & blowing agents, water treatment, agrochemicals, and pharmaceuticals applications. These applications drive the hydrazine hydrate market, globally. In 2016, the polymerization & blowing agents segment accounted for the largest market share of the global hydrazine hydrate and is expected to continue to lead during the forecast period. With growing demand for polymer products in various applications in automobile, electronic gadgets, and footwear industries, the demand for hydrazine hydrate in the polymers & blowing agents segment is likely to increase significantly in the coming years. Based on concentration level, the 60%-85% segment is projected to grow at the highest CAGR between 2017 and 2022. The 60%-85% concentration level hydrazine hydrate is majorly used in chemical synthesis, manufacturing of veterinary drugs, polymerization process initiation, or as a blowing agent. It is expected to be the fastest-growing concentration level segment of the hydrazine hydrate market, in terms of value, during the forecast period due to its ability to manufacture hydrazine salts from inorganic acids. Growth in the agrochemicals and water treatment industries has led to an increase in the demand for hydrazine hydrate. In 2016, Asia Pacific accounted for the largest share of the global hydrazine hydrate market. China is expected to account for the largest market share of the Asia Pacific hydrazine hydrate till 2022, whereas, this market in India is anticipated to grow at the highest CAGR during the forecast period. Hydrazine hydrate is toxic in nature. The toxic nature and carcinogenic properties of hydrazine hydrate pose a serious threat to the growth of this market. Several environmental and industry usage regulations are imposed by Occupational Safety and Health Administration (OSHA) and National Institute for Occupational Safety and Health (NIOSH), which is likely to impact the growth of the global hydrazine hydrate market. Hydrazine hydrate has also been classified as Group 2B by the International Agency for Research on Cancer (IARC) as well as the Environmental Protection Agency (EPA). Companies have adopted strategies such as new product development to enhance their market shares in the global hydrazine hydrate market. These companies engage in research & development activities to innovate and develop products that can open new avenues of applications. For instance, Arkema launched new derivatives of hydrazine hydrate at the CPhI 2014 trade show in France. These new derivatives are used as intermediates in synthesis of active ingredients to manufacture various medicines. Through this development, the company is focusing on expanding the application areas of hydrazine hydrate in the pharmaceuticals industry. 10.5 Otsuka-Mgc Chemical Company, Inc.
10.11.2 Haihang Industry Co., Ltd.